Charles and Wendy Park remember spotting a For Sale sign in the window of the old Owens Grocery Store in downtown Beaufort and wondering if it was time for a fresh start. They’d just left Charlotte to take jobs in Beaufort a few months before. And though they didn’t mind working for other people, Charles and Wendy had always dreamed of owning their own restaurant. Charles had graduated from the Culinary Institute of America in Hyde Park, New York. He imagined using his refined skills at dinner. Wendy had learned about Polish and Italian cooking from her aunts and mother. She wanted to create soups and pastries. But Beaufort is salt air and sunshine. Vacationers stroll along the boardwalk on Taylor’s Creek downtown. They tour historic houses. They watch craftsmen build wooden boats. Charles and Wendy knew that to be successful, their restaurant would have to reflect the personality of this place. When they opened Beaufort Grocery Company in the old Owens Grocery Store building in 1991, the couple started by serving a casual lunch. They asked themselves, What would people pack for a picnic on the beach? Their answer was an apple granny sandwich, which includes roasted chicken salad accented with dill weed, Granny Smith apple slices, Cheddar cheese, onions, and lettuce, all layered inside a fresh croissant. After 23 years on the menu, the sandwich remains one of the most popular dishes at Beaufort Grocery. Its success encouraged Charles to introduce the elegant dinner menu he’d imagined, and soon Wendy was the restaurant’s soup and pastry maven. Later, they opened a catering division next door and wrote a cookbook. 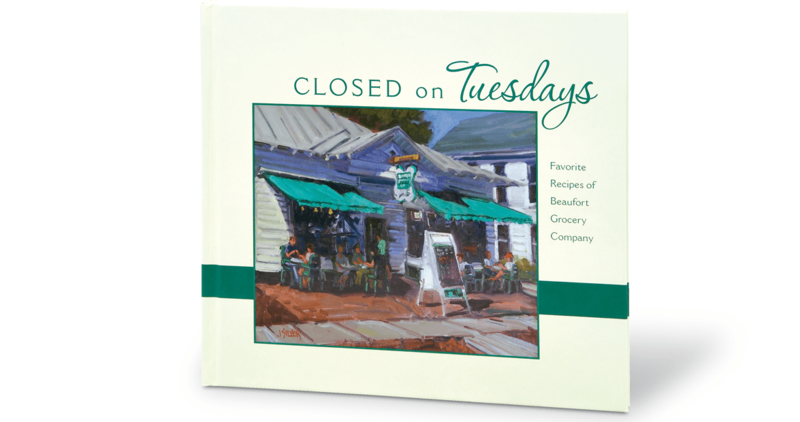 On the following pages, Charles and Wendy share three recipes from that cookbook, including one for Beaufort Grocery’s apple granny sandwich. It’s easy enough to make at home, but if you take a trip to Beaufort and stop in at Beaufort Grocery, you can taste the original that started it all. and click here to read a Q&A with Charles and Wendy Park.